BEAUFORT — They have gone now. They have vamoosed, skedaddled, cleared out and hit the road. There will no longer be a daily vigil to check on their whereabouts in the open grasslands that lay fallow or among the dry stubble of corn stalks in the fields near town. A large gray bird of modest plumage, stained with rusty streaks along its back, had delighted birders that flocked to see this rare visitor. A pair of sandhill cranes took a detour during their fall migration to the wintering grounds in Florida and decided to linger a bit in coastal North Carolina. There are three subspecies of this gangly bird: the greater, lesser and Canadian, that migrate and breed in North America, Canada and parts of Siberia. Three other subspecies, the Cuban, Florida and Mississippi, are more sedentary and do not migrate. In North America, some of the migratory populations utilize a number of different flyways. It appears that this particular pair of greater sandhill cranes started their migration from the Great Lakes region of the U.S. and Canada heading to their southern wintering grounds. Along the way, whatever possessed them to do so; they decided to take a hard left turn about midway down the Eastern Flyway to see what the East Coast had to offer. 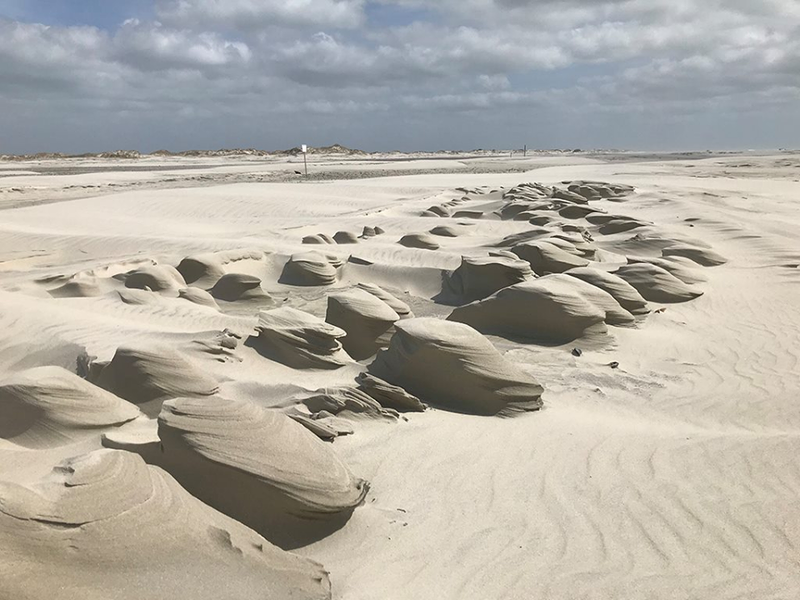 By mid-December, they found the bounty of the Crystal Coast to their liking, most likely the corn waste scattered on recently harvested fields. I was one those avian spectators that sought out the birds after news of their arrival spread. Many trips to Beaufort resulted in disappointment as these conspicuous birds eluded my scant surveillance. A bird this big should be easy to find. At almost 4 feet tall with a 7-foot wingspan and weighing in at 10 pounds, finding one of these relics should be easy. Thought to be one of the oldest birds in existence, unearthed fossils of these birds are close to 10 million years old. On one of my scouting trips to find the birds, I scanned an open field with my binoculars seeing nothing but protruding corn stalks cut low to the ground by the harvester. I lowered the glasses and stared out into the field when my eye caught some movement in a ditch separating the fields. There in the ditch, I saw three heads at the end of long necks peering over the ditch bank. Lifting the binoculars, I focused in on one of the heads only to see the familiar face of a great blue heron. Unhopeful, I swiveled to view the other two birds when the white cheek patch and bright red forehead of a sandhill crane came into view. There they were down in a ditch cavorting with a great blue heron. The cranes made their way out of the ditch, leaving the heron behind, and began scouring the field for bits of corn and insects. I suspect they were in the ditch looking for frogs. I watched the birds for a just a while, their long legs, long necks and sturdy bodies moved with an elegance and grace I thought not possible. That was until one of them half jumped, half flew over the ditch with a spastic motion, yet landed delicately with a flick of its head as if to say, “I nailed it.” These two stuck close together, obviously a mated pair that will stay together for life. Even though I was a ways off, the pair were alert to my presence so I moved on allowing them to forage undisturbed. 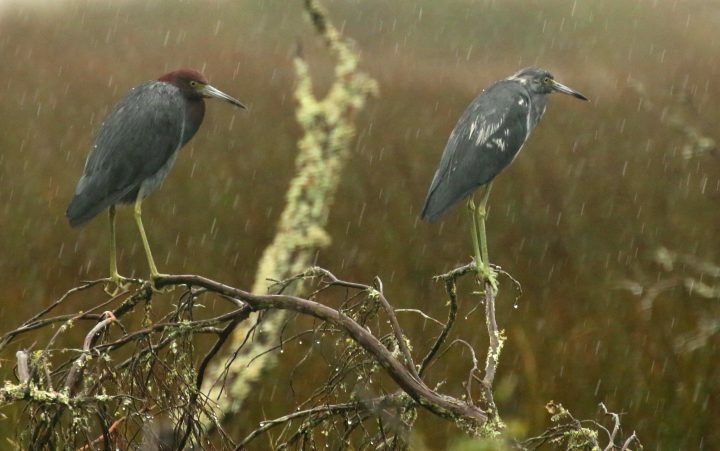 Paula Gillikin, central sites manager for the North Carolina Coastal Reserve and National Estuarine Research Reserve, is quite familiar with this pair of winter wanderers. 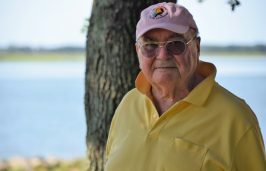 She has been documenting their visits to the Beaufort area since 2013. 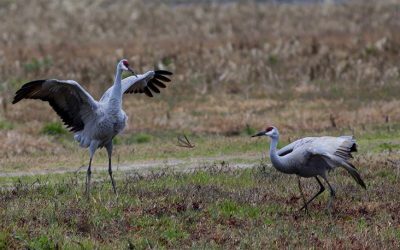 While the pair spends their days in the farm fields looking for food, they seek refuge at night at the nearby Rachel Carson Reserve, a site that Gillikin manages that is only two and a half miles away, as the crane flies, from the feeding sites. The shallow open tidal flats on the south side of the reserve are a perfect roosting spot for the birds. Here their vision is unobstructed and any predator, such as a coyote, would be reluctant to enter the water. If threatened, these avian giants will not back down. They will stand tall, open their enormous wings and hiss as if they are possessed. If the confrontation turns physical, they will throw out some damaging kicks that would leave any martial arts instructor impressed. Gillikin is fascinated with how predictable and habitual the birds are with their annual arrival and departure as well as their daily routine. 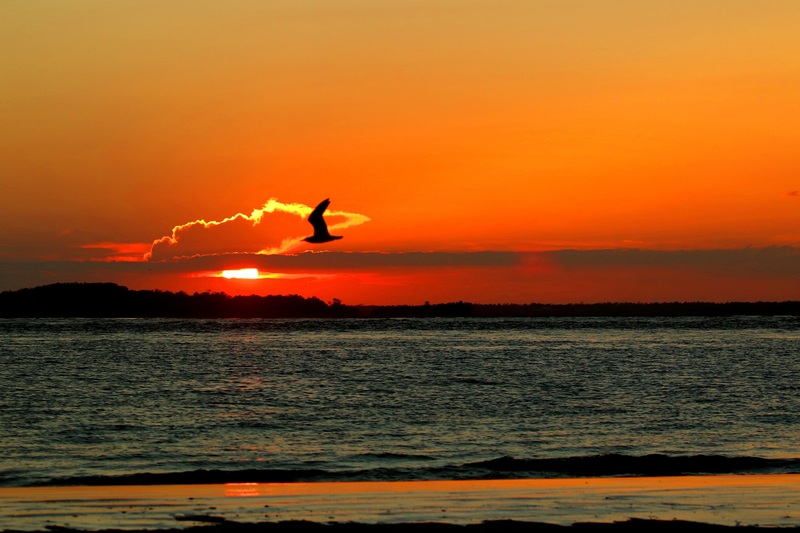 “Each day, around sunrise and sunset, they follow the same flight path over Gordon Street to reach the reserve,” Gillikin said. 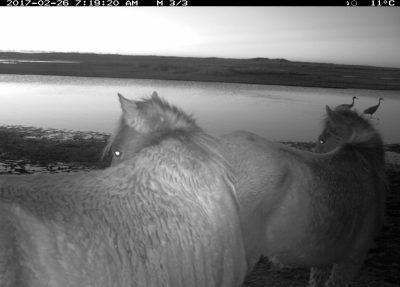 She has watched their movement within the reserve as well with her remote camera, catching images of them strolling among the wild horses on part of the reserve called Town Marsh. The pair is now obviously returning to their northern nesting grounds. To conserve energy, they will soar high in the sky, at times reaching up to 12,000 feet, taking advantage of strong thermal winds if they are in their favor. 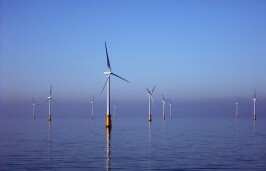 A benevolent breeze can help them cruise up to 50 miles an hour and cover 150-400 miles in a day. During migration, especially the spring return, they need to fuel up to replenish fat reserves. One of the greatest spectacles of animal migration occurs each spring when sandhill cranes stream northward following the Central Flyway. Half a million of these birds will rendezvous in controlled chaos along a 70-mile stretch of the Platte River in the plains of Nebraska. Here they will add on two pounds, fattening up on field corn and invertebrates found in the marshes along the river. After about four weeks of gorging, they will continue on to their northern breeding grounds. This stopover is so important, it has been designated as an Important Bird Area of Global Significance. 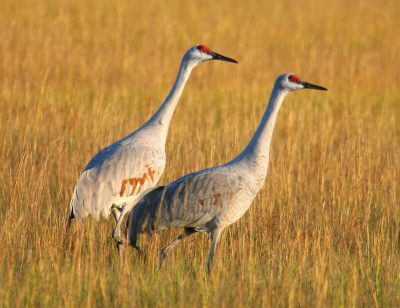 Sandhill cranes, as well as other species of cranes, have been prominently portrayed in cultures throughout the world. They have been symbols of good luck, vanity, loyalty, longevity and good fishing. The shape of a crane is arguably the most popular shape used in the Japanese art of origami. The Greek storyteller Aesop used the crane in a number of his moral-laced fables. One such fable, tells the story of a wolf that rewarded a crane by not eating it after the crane removed a bone from the throat of the choking wolf. Annual sightings of these cranes in North Carolina are becoming more formal. Along with the Beaufort pair, three sandhills spent the winter in the Pungo Unit of the Pocosin Lakes National Wildlife Refuge. 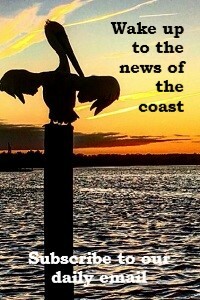 A group of four of the birds made the Swansboro area their winter home in 2007-09. In 2015, a pair hung out in the parking lot of a Bojangles restaurant in Sanford for four weeks during the spring migration. 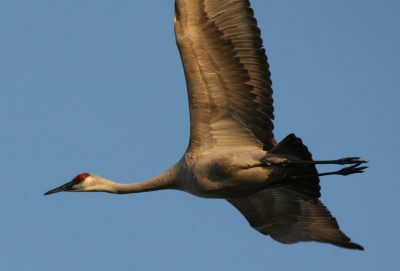 Sandhill cranes are numerous, and some populations are increasing, although the non-migratory populations are diminished by loss of habitat. But it was not that long ago that overhunting and loss of wetland habitat had this species heading to extinction. Sandhill cranes were once so imperiled that the great conservationist Aldo Leopold stated “the last crane will trumpet his farewell and spiral skyward …” Protection by the Migratory Bird Treaty Act along with the preservation and restoration of wetlands within their traditional range has been critical to their recovery and survival. Sandhill cranes are well known for their call, often described as a trumpet or bugle, which can be heard for more than a mile. It is a call of the wild and a call for wilderness.